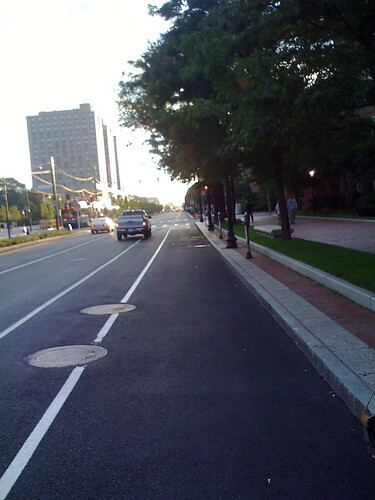 As we went into the weekend, Boston Mayor Thomas M. Menino’s Gracious Government of the City of Boston introduced two new bicycle lanes into Boston, increasing the number of bicycle lanes on non-state roads in the area formerly known as Boston to two. 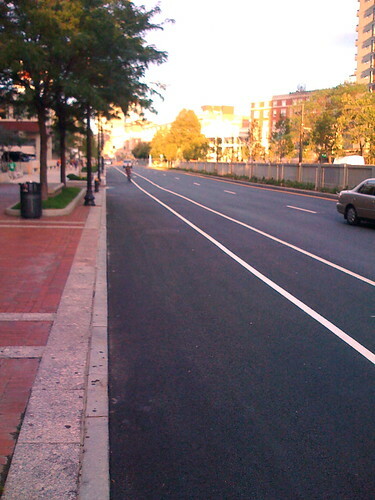 Here’s a look at a part of the bike lane at Commonwealth Ave. Note the car using the bike lane. …and the bicyclist avoiding the lane. Next time I’m around the American Legion bike lanes I’ll snap a shot of them. * The city formerly known as “Boston” has been formally renamed to “Mayor Thomas M. Menino’s Gracious Government of the City of Boston”. Fresh new signs to come shortly. That reminds me a lot of the bike lanes in Honolulu while I lived there. On more than one occasion, I felt a car mirror touch me as it passed me. And most places make it illegal to ride on the sidewalk, so where exactly are bikes supposed to go? Luckily where I live, the neighborhood is pretty bike friendly. There a lanes on just about all the roads. What really irks me Justin is that these two lanes are really more of a political ploy to gain votes for the 2009 mayoral election. Btw, I’ve updated the post with a link to the Boston Globe article that announced these lanes. 3.2 miles is a tiny amount of the streets here in Boston and these streets were already wide enough to be semi-bicycle friendly. I’d like to see some “Share the Road” signs and some city streets converted into bicycle only paths (there are way too many little streets downtown that serve only to increase congestion and confusion) rather than repaving two wide roads. In either case, it’s a start but I’d like to see a much more progressive plan for non-car transportation. If I was Mayor, we’d implement a bike rental program hooked into licenses along with converting some streets into non-car paths and most importantly increase the requirements to get a driver’s license here (among many other improvements). A few bike lanes nearly a year after announcing the lanes doesn’t reflect a city ready to embrace the bicycle as its most logical mode of transportation (the City of Boston is small enough that cars are nearly nonsensical here). A car driving in the bike lane doesn’t surprise me at all. This is actually the first time I’ve seen a bike lane, honestly. Nothing to do with biking, but the car in the bike lane reminded me. There was a woman jogging down the sidewalk the other day while I was driving by, when she decided she didn’t like the sidewalk anymore, she wanted to move and run on the road instead. There was nothing that got in her way on the sidewalk, nothing blocking the path, she just decided she preferred to be sideswiped by cars, apparently. To be fair to that truck, he/she very well might have been turning right at those lights, thus making it OK to be in the bike lane. Still, if the truck was going straight it doesn’t surprise me either that they’d end up in the bike lane. I’ve seen the jogger who thinks she’s a car before Stefanie! To be fair, she was going at a good clip but I still thought it was crazy to see her jogging in the street. Actually the first thought I had when I saw her was “awww, that’s so cute she thinks she’s vehicles” which then turned to fear that this 60+ year old women could probably outrun me which then led to sheer admiration of the woman’s lunacy for running in the street. That had me almost cracking up. When I see things like that, all I can tell myself is, “Remember where you live…” I miss New England so much! As much as there are some… educationally challenged people there (my dad likes to talk about how stupid people are), it’s at least 10x worse here!